Tufts Relay For Life (RFL) hosted its all-night cancer fundraising event in the Gantcher Center. The event began at 6 p.m. Friday and lasted until 6 a.m. Saturday. The event featured food donated from local restaurants, performances by Tufts entertainment groups, a raffle and four ceremonies throughout the night, according to co-chairs Elana Shapiro and Rachel Coyne, both seniors. RFL’s slogan is “Celebrate, Remember, Fight Back,” which inspires the different stages of the event, according to Coyne. The event begins with an opening ceremony, followed by the Luminaria, then Fight Back before ending with a closing ceremony, Coyne said. According to Coyne, during the Luminaria, all the lights were turned off and different speakers shared stories of either their own or their loved ones’ battles with cancer. 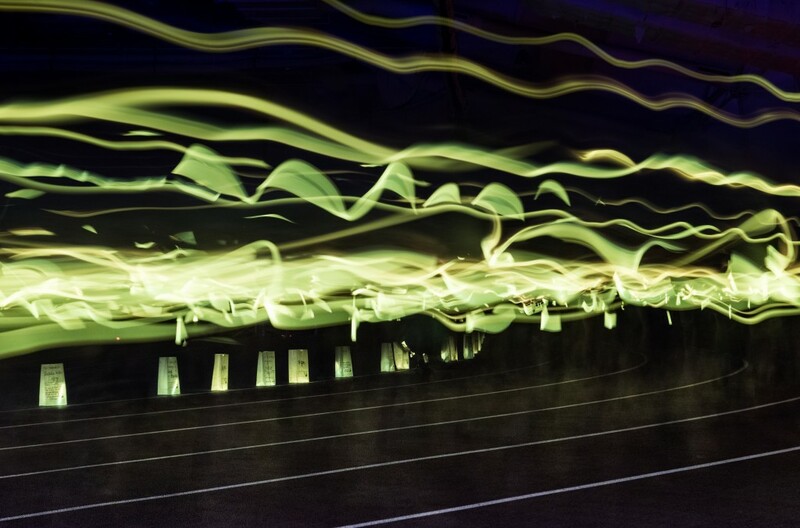 Afterwards, attendees cracked glow sticks and walked out onto the track and completed several laps, Coyne said. “It’s a manifestation of the actual community that’s like coming out to support each other in this fight … Then there’s Luminaria bags which are like paper lunch bags that people decorate in memory of certain people’s names … So it’s a further reminder that this is a personal fight for people in our community,” Shapiro said. At around 2:30 a.m., the Fight Back stage was held. This part of the event aims to rejuvenate participants at a time when energy tends to be low, Shapiro said. “Everyone’s sleepy and definitely a little loopy and so … we hear a speech and do some sort of physical exercise that reminds everyone that you still have the power to do something in the fight, and this year we did zumba,” Shapiro said. There is not yet a final count on how many people attended the event, but according to Shapiro, 600 people were registered beforehand. This number does not include those who registered at the door. Coyne estimates that they went into the event with $73,000 raised, and though there is not yet a final count, she predicts they will have raised between $75,000 and $80,000 in total. Tyler Lueck, head of RFL’s entertainment committee, said the event featured performances by the Amalgamates, Belly Dance, Tap Ensemble, La Salsa, Garba (JumboRaas), Sarabande, Spirit of Color, Tamasha, S-Factor and Bhangra, some of whom offered open classes. After the Luminaria, several musical acts performed including Like Wolves, solo performer Graham Starr and Blue Ives, Lueck, a junior, said. This year the event also featured a more educational aspect, according to Coyne. RFL is the culminating event of months of fundraising work done by 49 teams, according to Coyne. According to Lueck, fundraising begins in the fall and is done by sending emails, performing letter-writing campaigns and talking to different potential donors. Shapiro was happy with the event and all who participated.